One of the top reasons to go to a once a year oral health exam is so our dentists at Metro Decatur Dental Group PC can spot problems, like cavities in the teeth, gum diseases, and enamel decay in their first stages. Tooth-colored fillings, also known as composite resin fillings, can fill and seal an area of the tooth that has been infected with a cavity. Tooth-colored fillings may be used to repair cracked and broken teeth, and areas of the teeth that are worn out from nail-biting, misuse, and teeth grinding. 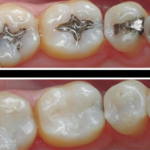 Unlike previous amalgams, tooth-colored fillings are created from a composite resin that is dyed to blend into the natural teeth for fillings that retain the normal appearance of the teeth. A filling is a, straightforward fix at our Decatur, Georgia office by our dentists. With ideal care, a filling can seal the teeth for near 10 years. A filling can be completed while at Metro Decatur Dental Group PC with the patient under local anesthesia for any discomfort or anxiety. Once the patient is prepped, our dentists will use a drill to accurately take off the affected area of the tooth enamel. After that, our dentists will etch the tooth with an acid gel to safely bond the filling when it is placed. The resin is put on and hardened with a laser light. Our dentists will continue to brush on layers of resin and harden them with the light until the tooth is strong and sealed. Any unnecessary resin can be taken off with the drill for a perfect finish. After the composite resin filling is on and dried, our dentists will polish the resin for level edges. Once the numbing agent has worn off, the patient usually has sensitivity to temperatures, tastes, pressure, and additional sensations. This sensitivity is short-lived and should not be noticeable for more than two weeks. The patient should start a consistent home mouth care program, including brushing, flossing, mouthwash, in addition to on-going professional cleanings and exams at Metro Decatur Dental Group PC. Our dentists will monitor the situation of the dental filling at each visit and help the patient understand when they need a fresh filling. The majority of dental insurance providers pay a portion of the cost of a dental filling whether it is a first dental filling or a replacement for an older amalgam filling. Metro Decatur Dental Group PC will aid each individual in deciding their dental insurance coverage and their financial responsibility at their appointment. For patients who don’t have insurance coverage, our dentists provide a variety of financial plans through Metro Decatur Dental Group PC in Decatur, GA. Dental decay could happen to everyone, although they don’t have to diminish the the appearance of the smile with fillings at Metro Decatur Dental Group PC serving DeKalb County, Georgia. These fillings replace areas of decay and protect the tooth while matching the natural teeth to blend flawlessly. Talk to our dentist about how dental fillings can enhance the dental enamel while keeping the smile stunning!